Aligned with the new governor of the state of California’s vision, two African Americans who were recently sworn-in to their elected seats both said they are also committed to making bold and progressive changes. 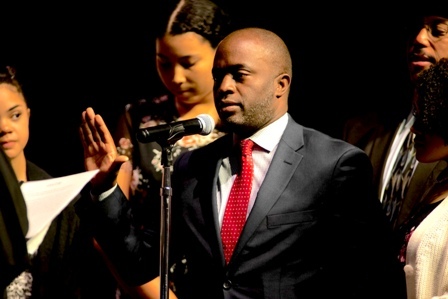 Tony Thurmond, who took the oath as superintendent of Public of Instruction, and Malia Cohen, affirmed as one of four members of the State Board of Equalization, have expressed excitement about carrying out the duties of their positions. Right after Newsom was sworn in as California’s 40th governor at the State Capitol in Sacramento, he laid out a long list of priorities aimed at benefitting all Californians. Especially, people who struggle the most in the state. During Newsom’s inaugural speech, under a well-constructed tent in front of the facility where state laws are made, the Democrat from San Francisco outlined policies that would deal with affordable housing, homelessness, closing the achievement gap in education, affordable healthcare, hunger and equity in pay. Gov. Newsom addressed many of the same issues that are prevalent in the Black community. But the former lieutenant governor and mayor of San Francisco sent a clear message that his priorities will strengthen the state and it will be done with complete financial responsibility. Well into his address, Newsom also went as far as taking shots at the Trump administration and its policies, signaling his political direction to go far left during his tenure as governor. Newsom said Donald Trump’s current time in the White House is not on a stable foundation. Thurmond, 50, also made a bold statement at his swearing-in ceremony at C.K. McClatchy High School in Sacramento. A Democrat, Thurmond became the 28th state superintendent of Public Instruction and the second African American to hold the office. Thurmond chose McClatchy High School, “strategically and intentionally,” he said. The school has been embroiled in racial incidents in the last couple of years, including a racist video that was posted on Instagram by two of its students. A female and male appeared to be in blackface while the latter made racial epithets towards African Americans. The incidents concerned Thurmond, now a former state assemblyman. McClatchy was also the focus of a student science project conducted by non-black students that questioned their peers of color’s intelligence. Thurmond’s policies are not solely centered around students of color, but each and every student in the state no matter race, color or creed. McClatchy High’s role is to serve as a model for the entire 6.2 million student population and more than 10,000 schools. Thurmond’s plans include keeping schools safe, providing school-based mental and physical health services, reducing the achievement gap, expanding access to early childhood education, creating pathways to careers and college, addressing teacher shortages, enhancing highly-trained and certified educators. Dr. Margaret Fortune, who comes from a long line of family educators and runs successful charter schools in the northern and parts of California, attended both Newsom and Thurmond’s swearing-in events. She is eager to see the positive energy Thurmond can bring to his office. Cohen will start off the next part of her political career at the state level after serving on the San Francisco’s Board of Supervisors. Just like Newsom and Thurmond, she emerges with a great sense of exuberance. 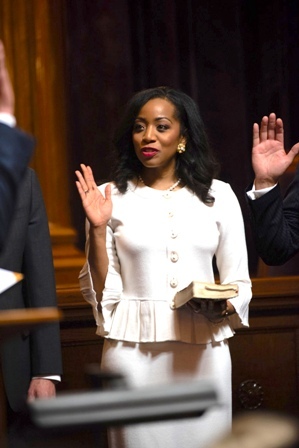 Cohen was sworn into office as a member of the State Board of Equalization, BOE, along with Ted Gaines (First District), Tony Vazquez (Third District), and Mike Schaefer (Fourth District) at the Stanley Mosk Library and Courts Building near the State Capitol. Former Gov. Jerry Brown signed legislation stripping the board of some of its power in June of 2017 after an audit by the Department of Finance found improprieties. The BOE will continue in its role to review property tax and insurer assessments, alcohol and pipeline taxes. The board members, including Cohen, all vowed that the state’s tax commission will regain the trust of the community. Cohen, Vazquez, Gaines and Schafer were elected to four-year terms. Cohen represents 23 counties and 9.5 million constituents in the Second District. Betty Yee, who was re-elected as the State Controller and who was critical of the past behavior of former members of BOE, is the fifth member of the state’s tax management. Yee has new associates to work with now, despite the fact that BOE has no control of the Department of Tax Fee Administration or Office of Tax Appeals. These newly-created tax departments run independently of BOE. Cohen, 41, has a bachelor of arts degree in political science from Fisk University in Tennessee and a master’s degree in public policy and management from Carnegie Mellon University. She was elected to serve as a member of the San Francisco Board of Supervisors in 2010. She held the position from Jan. 8, 2011, to Jan. 7 of this year. Cohen, born in the Richmond District of San Francisco, was the president of the Board of Supervisors for the last six months, replacing London Breed who was elected as the city’s mayor. Mark Ridley-Thomas, a former state senator and assemblyman who is now a member of the Los Angeles County Board of Supervisors, attended Cohen’s swearing-in ceremony that took place in the historic courtroom of the Stanley Mosk Library.